Sharpen the skates, bundle up the kids and hit the ice for some pre-holiday celebration. 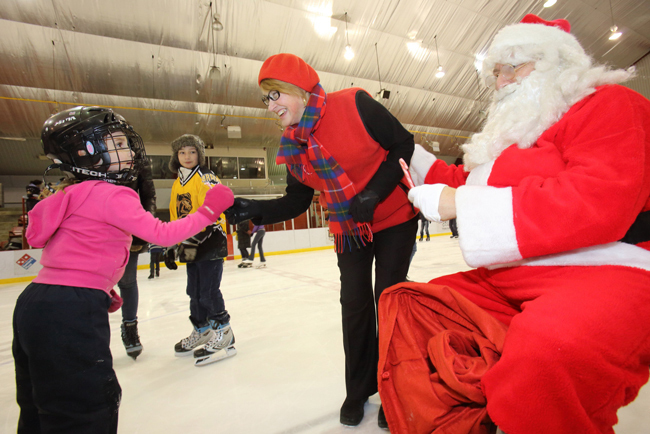 Principal Suzanne Fortier will be hosting her annual family Skating Party on Sunday, Dec. 4. On Dec. 4, Principal Suzanne Fortier will be hosting her annual family Skating Party at McConnell Arena. Sharpen the skates, bundle up the kids and hit the ice for some pre-holiday celebration. Principal Suzanne Fortier will be hosting her annual family Skating Party on Sunday, Dec. 4. All McGill staff and their families are invited for hot dogs, snacks, drinks and fun from 2:30 p.m. to 4:30 p.m. at the McConnell Arena on the downtown campus. It’s a free event, but McGill staff are asked to please make a non-perishable food donation to the Yellow Door’s Food for Thought program. There will be collection boxes at the arena. Reserve your spots by phoning extension 0273 or 6555.